Last night at SummerSlam, during the Brock Lesnar vs. Randy Orton main event, we saw something that’s an increasing rarity in WWE— blood, and lots of it. The match began conventionally enough, at least by Lesnar standards. Lots of German suplexes. Lots of shoulder thrusts. Lots of sweat. The blood was quite literally streaming out of Orton’s head at one point, and the Viper looked dazed. The referees stopped the match and awarded Lesnar the TKO. Shane McMahon ran into the ring to check on Orton. Lesnar F-5’d him. And SummerSlam went off the air. The speculation on Twitter began almost immediately. Was the blood real? Were the elbows scripted or improvised by Lesnar? Was the blood intentional or not? Was Lesnar deliberate or clumsy? Was that the way SummerSlam was supposed to end? Let’s address the first speculation: The blood was most definitely real, and Orton was legitimately injured. He did not use a razor blade to open a cut; he bled “the hard way.” Later in the evening, Orton’s wife confirmed the injury with a tweet of her husband’s jagged wound. Orton needed ten staples to close his head. So that speculation is out of the way. Which brings us to the more interesting question: Was Brock attacking Orton with malicious intent, or was this part of the show? There’s a lot of evidence to support that this was not planned, or at the very least, was not supposed to be as violent or as gory as it turned out to be. First, WWE has a PG rating and is transitioning into a family-friendly product. Having one of the most popular Superstars lying in a pool of his own blood does not convince parents to bring their young children to shows. Second, from a backstage standpoint, this was a bizarre way to end the second-biggest WWE show of the year after WrestleMania. The prior match, Rusev vs. Roman Reigns, ended before it began; the bell didn’t even ring, and the two wrestlers got into a messy brawl outside the ring. That makes two abbreviated matches in a row. This was no way to send the fans home happy. Why would Lesnar want to split open Orton’s head? There are perhaps a couple of reasons. In the buildup to this match, Orton made comments that might have hit Lesnar too close to home. Like when Orton said that he would beat Lesnar with “no enhancement needed” (Lesnar was busted for using estrogen blockers in the UFC). In hindsight, Jericho’s response to Orton—“Something tells me you’re going to pay for that little comment”— was prophetic. Another speculation is that Orton was uncooperative in the match. He wasn’t jumping with the German suplexes, which forced Lesnar to deadlift his opponent on every one of his signature moves. Orton also wasn’t particularly careful either, when he pulled off his signature rope-hung DDT, he barely protected Lesnar’s head. Perhaps the Beast was exacting revenge for these slights. Maybe. Or maybe Lesnar is just really, really careless. This isn’t the first time that he’s injured people in the ring. Combine that carelessness with Lesnar’s part-time status/lack of practice, and you have a recipe for disaster. And if all this was planned and scripted? It’s an appalling creative decision. Orton is 36 years old. He just got back from shoulder surgery after being out for nine months. He has a history of concussions. WWE has been cracking down on concussions, and they are currently embroiled in a lawsuit that directly pertains to them. WWE banned moves like the piledriver and the Curb Stomp, and they’ve banned all chair shots to the head. To now put Orton in a situation where he could be permanently damaged is an irresponsible, horrible message to the locker room—that ultimately, anyone is expendable in the name of generating buzz. So that’s the long and short of it. Lesnar may have legitimately assaulted someone in the ring; watch the video and judge for yourself. And if the beatdown was planned, then WWE was insane and hypocritical to approve it. 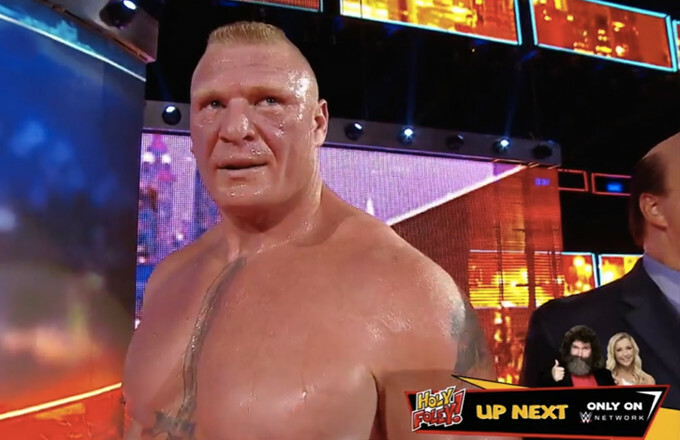 Either way, no one, especially Lesnar, comes out of SummerSlam looking particularly good.